And one more day primarily on the bus. We are covering quite a bit of territory on this itinerary. Our guide, Alex, provides us with some history of the break-up of Yugoslavia as well as both the 10 day Slovenia war and the 4 year Croatian war. After WWI, Yugoslavia came into existence by combining territories of the Slovenes, Croats and Serbs (which was formerly part of the Austro-Hungarian Empire) with the Kingdom of Serbia and the Kingdom of Montenegro. 1946 the communist government came into power and the country was renamed the Federal People’s Republic of Yugoslavia, also adding territory from Italy. Josip Broz Tito was the ruler as president until his death in 1980. The Republic was made up of six socialist republics: Bosnia and Herzegovina, Croatia, Macedonia, Montenegro, Slovenia and Serbia. 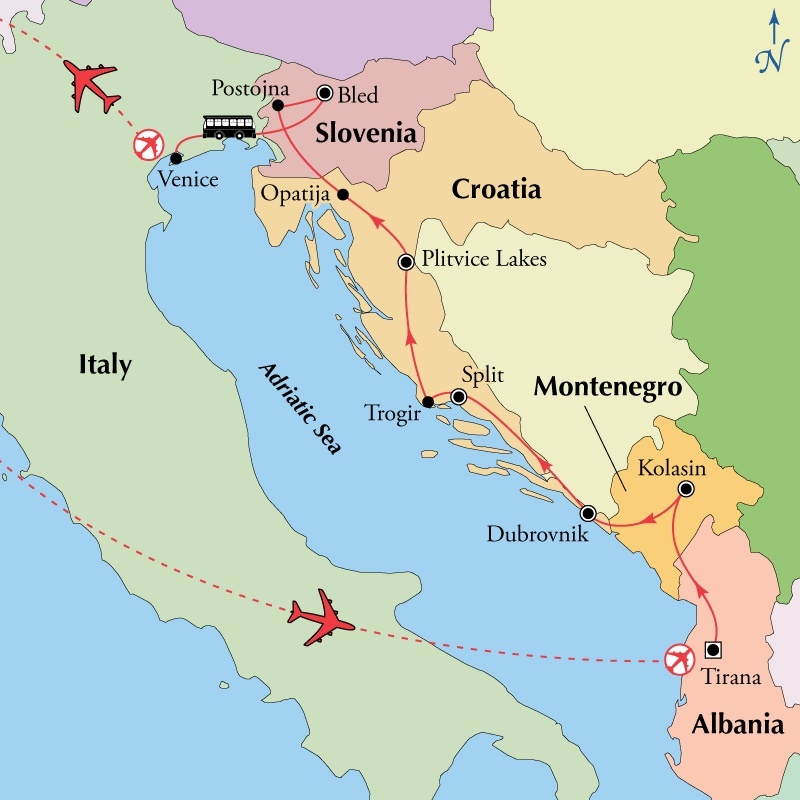 In the 1980’s, following political upheavals and economic crisis Yugoslavia broke up along republic borders and formed five countries which lead to the Yugoslav Wars. Some of the atrocities and ethnic cleansing contributed to Milošević are mentioned but not in a lot of detail. In all honesty I found the political history of Croatia very confusing. More often than not, the majority of our group sleep between stops. Here is a link if you want to read more about it. Alex is from Croatia and still harbors some resentment toward Montenegro and Serbia which is evident in her descriptions. I did make a few notes about current day living in Croatia. They have a Mediterranean climate. There are two strong winds that blow through Croatia. Bora are considered an evil or bad wind. If you commit a violent crime, even including murder, during the bad wind, people have been known to be found not guilty blaming it on the wind. You need a passport to travel from Dubrovnik, Croatia to another part of Croatia because you pass through Bosnia. The strip of land to the ocean that separates the two parts of Croatia was granted to Bosnia in exchange for protection. They used to have a thriving business in textiles, shoes and steel, but today the #1 business is tourism. Food products include honey, eel, tangerines, frogs, oranges and strawberries. They also make an excellent olive oil, but it is only for local consumption as they do not make enough to export. There is currently an incentive to produce more olive oil. They have 1200 islands, 64 of them are inhabited. 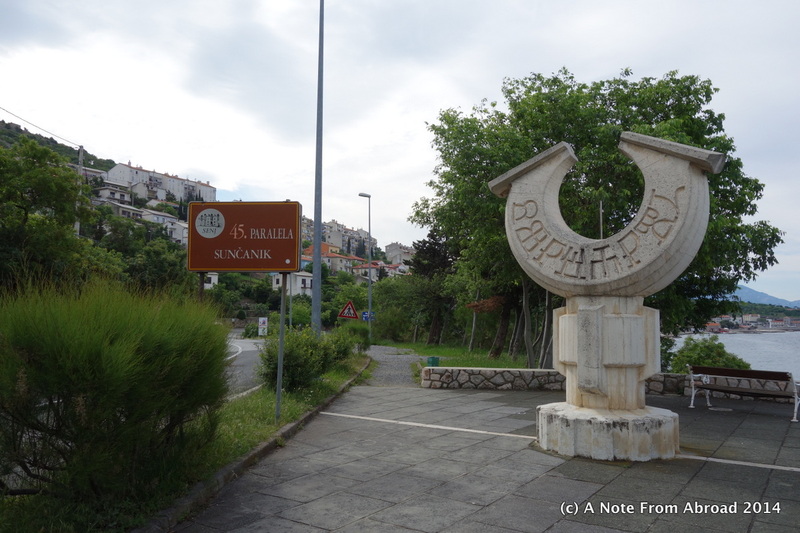 We drive along the Istrian Peninsula past the islands of Cres and Krk and have a rest stop at the 45th Parallel. I think of the Mediterranean area as much further south than it really is. 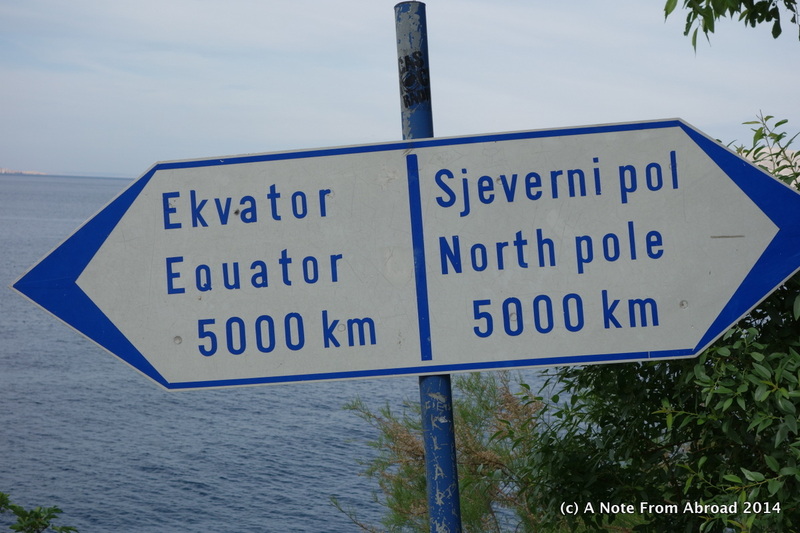 For reference, the 45th parallel is 1/2 way between the North Pole and the Equator. In the USA, it passes through Oregon, forms the border between Montana and Wyoming, intersects Lake Champlain, and roughly makes up the border between the US (New York and Vermont) and Quebec, Canada. This is definitely one of the largest cave systems I have ever been in. A cross between Pirates of the Caribbean and a small track train ride, our underground adventure begins. 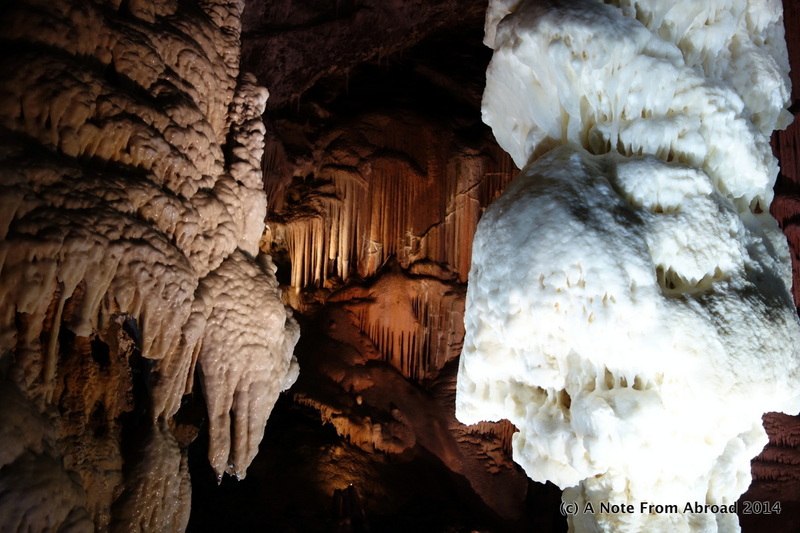 With 21 Km of passages filled with spaghetti formations, stalactites and stalagmites, it is impressive. Departures leave on the hour, as we are boarded onto small double seated train carts that will take us on a 10-15 minute ride deep below the surface. At that point we walk a short distance looking to find a posted sign in the appropriate language to join up with a tour guide that will take us on an hour long walk through the well-lit chambers. Sections of the walk include steep ramps, but they have good hand rails and a special no-slip texture on the flooring making it (relatively) safe. The cave guide is professional and offers up good explanations about the discovery, history and geology of what we are seeing. After the walking tour, we again get back on the train for the return ride back to the surface. For anyone that has mobility issues, you can remain on board the train for a round-trip ride and skip the walking section. You will still see a lot of beautiful formations. One interesting fact: This cave had electricity installed in 1884 earlier than London! Finally, after a very long day, we arrived at our destination, Bled, Slovenia. Fun fact ~ Slovenia is the only country that has the word LOVE in its name! GRATITUDE MOMENT: Today I am grateful for electricity. When our guide briefly turned off the lights deep within the cave, the darkness was startlingly complete. Please add your email address to our list if you would like to subscribe to receive a reminder when we post more pictures from our ongoing travel adventure. There is also a place near the bottom of this page for you to leave a reply if you have any comments, suggestions, or just want to say hello. Thank you for following along! 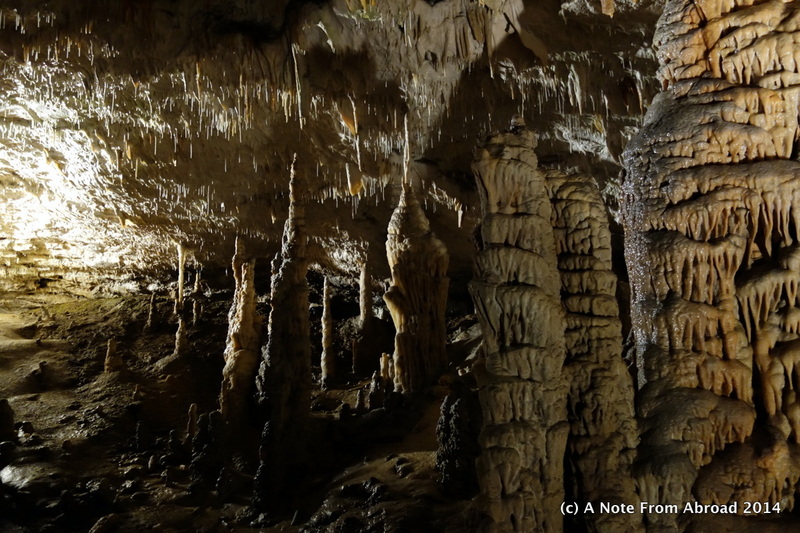 This entry was posted in Croatia, Europe, Slovenia and tagged 45th parallel, cave, Croatia, History, Photography, Postnoja Cave, Slovenia, Travel, Yugoslavia. Bookmark the permalink. This is one beautiful travel post. Neat and informative, I really liked the way it started with the old style route map and the way the history of the country been given in summary. Thank you Sreejith! The history of most countries is complex and it takes hearing about it several times before it starts to sink in for me. I find that if I break it down into a short, simple format that it is easier for me to grasp the basics. I hope this helps others as well. not mentioned in the above article, is the fact that in the pools deep in the cave dwell a strange creature called Olms,or cave salamanders. which are about a foot long, and white. In the area they are called human fish because of their colour. I went there in 1966, and did the ride on the train as described, – wonderful providing you are not too scared of the dark! Wesley, I did not know about the Olms. Thank you for telling me about them. I love the “gratitude moment” of your posts. I may borrow that idea for my blog too. To be on a journey such as ours we have so much to be thankfully for! My gratitude moments are my favorite part of each day. It keeps my priorities in line, my mood elevated, and focuses me on how blessed we are and what truly matters.